The U.S. Department of Navy, through funding from the Office of Naval Research (ONR) has entered into full production its solar generator, the Ground Renewable Expeditionary ENergy System (GREENS). GREENS is a portable, 300-watt, hybrid battery generator that uses the light from the sun to produce electricity. It was developed to provide Marines with continuous power in the battlefield. In fact, several GREENS are already being used in the field. Cliff Anderson is the logistics program officer in ONR's Expeditionary Maneuver Warfare & Combating Terrorism Department. He says that GREENS significantly reduces the amount of fuel that has to be delivered to the field. With less fuel to deliver, it minimizes the number of warfighters on the roads, convoys and hazards. It also lowers the cost of logistics associated with distributing fuel. "That was really the objective: to get warfighters out of harm's way and reduce the cost of transporting fuel." The GREENS project was conceived in 2008 when a Universal Needs Statement was submitted from Iraq for an expeditionary renewable power system. Approval for this project was expedited and technical execution took less than six months with the first unit tested in July 2009. The system transitioned from the ONR to the Marine Corps Systems Command (MCSC). From there, GREENS went into production. The solar powered generator provided Marines with power to use various military devices. Several small Marine Corps outposts have even used GREENS as their sole energy source. The overall goal for GREENS is that it will reduce the logistics burden for providing power to remote locations. It provides the military the AC and DC power it needs to charge typical communication, targeting, and computing devices. GREENS also reduces fossil fuel use otherwise needed for typical generators, and will lessen the need for fuel resupply, reducing the associated threats to vehicle convoys in Afghanistan and Iraq. Justin Govar, chemical engineer and program manager, Expeditionary Power Sources Office, says, "GREENS is important because within the Marine Corps we are fighting in areas that are remote, that require very difficult logistical trains to get to." "Infantry battalions that are far forward do not have immediate access to a wide range of logistics and maintenance equipment; therefore, any source of power that requires no [military-grade fuel], low maintenance and no special skills to operate becomes an instant success," said Maj Sean Sadlier, a logistics analyst with the Marine Corps Expeditionary Energy Office, who trained users on and tested GREENS in the field with India Company, 3rd Battalion, 5th Marine Regiment. Additionally, "GREENS is modular, portable, rugged and intuitive enough to deploy in a combat environment. Units trained on GREENS as part of pre-deployment training have provided positive feedback." 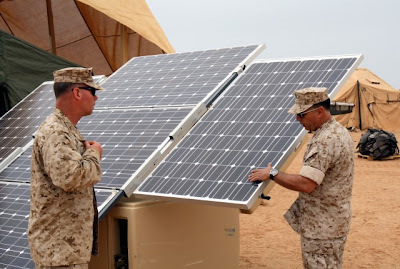 The Ground Renewable Expeditionary ENergy System supports the Marine Corps' objective of generating all power needed for sustainment and command, control, communications, computers and intelligence equipment in place in the field by 2025. This vision, as laid out in the USMC Expeditionary Energy Strategy, aligns with the Marine Corps Vision and Strategy 2025. The goal is to enable Marines to travel more lightly and quickly by reducing the amount of fuel needed. GREENS was set up and tested at NSWC Carderock in West Bethesda, Md. It was subjected to a 300-Watt continuous power testing at NAVAIR China Lake during the 2010 Empire Challenge. Ambient temperatures recorded during the China Lake exercise exceeded 116 degrees Fahrenheit and even under these extreme temperature conditions, the system provided an average of 85% of the rated energy. This result exceeded expectations and led to an MCSC request that the product be rapidly developed and readied for acquisition. 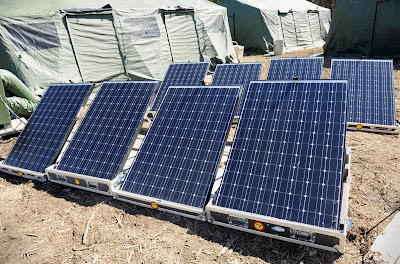 The solar powered generator is composed of 1600-watt solar arrays and rechargeable batteries combined to provide 300 watts of continuous electricity for Marines in remote locations. Additionally, there is a toolkit feature that allows Marines to enter their expected mission profile and determine which components from GREENS that they will need to take with them. GREENS can be rapidly deployed and is High Mobility Multipurpose Wheeled Vehicle (HMMWV) transportable.